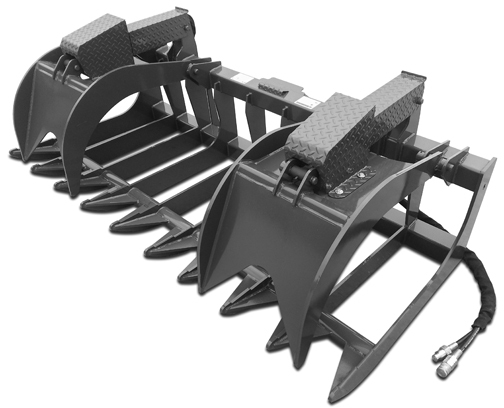 The X-treme Root Grapple is the grapple of choice for those who need an attachment that will hold up in severe applications. It can handle more material and is more rugged than our other grapples. It is built from 5/8? thick steel plate on the top, 1/2" on bottom, and incorporates 4" square tubing. It also features enclosed hydraulic cylinders and shafts. It was built in mind for the big skid steer loaders and compact track loaders that are 65 hp and up. The CID xtreme root grapple can handle pretty much anything you want to go up against. The rod and cylinder covers come standard on the x-treme root grapple and are diamond plated and gives it the look it so deserves, which is “Tough”. This root grapple can pick up heavy logs, and big amounts of debris material without hesitation. It is the one to have for big storm cleanups and natural disasters. You can rest assure that the CID X-treme Duty root grapple will last for many years to come. Recommended machine sizes: 65 HP and above.